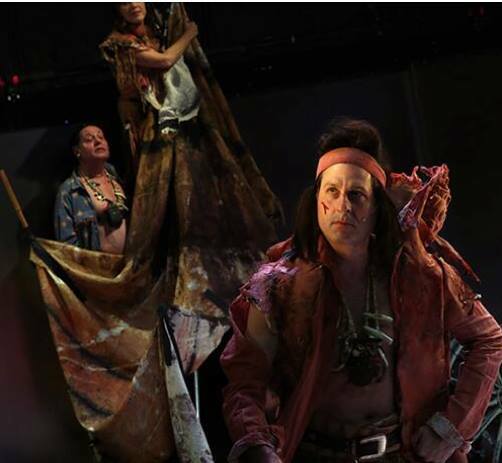 The Wooster Group’s newest production, Cry, Trojans!, tackles the Trojan side of Shakespeare’s dark and scabrous Trojan War play about sincere love corrupted and the downfall of a noble hero. 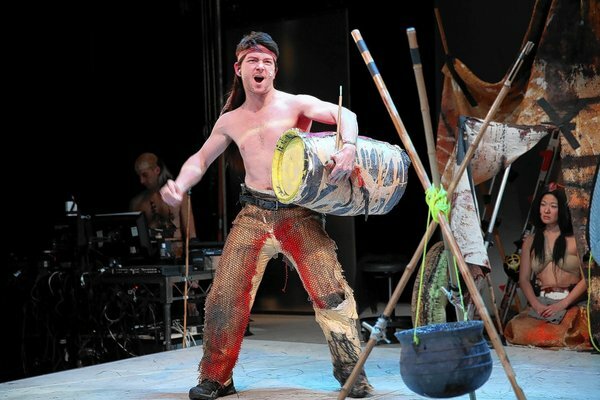 The piece originated as a co-production between The Wooster Group and the Royal Shakespeare Company for the World Shakespeare Festival, presented in conjunction with the 2012 London Olympics. In that version, the RSC played the Greeks and the Group played the Trojans. 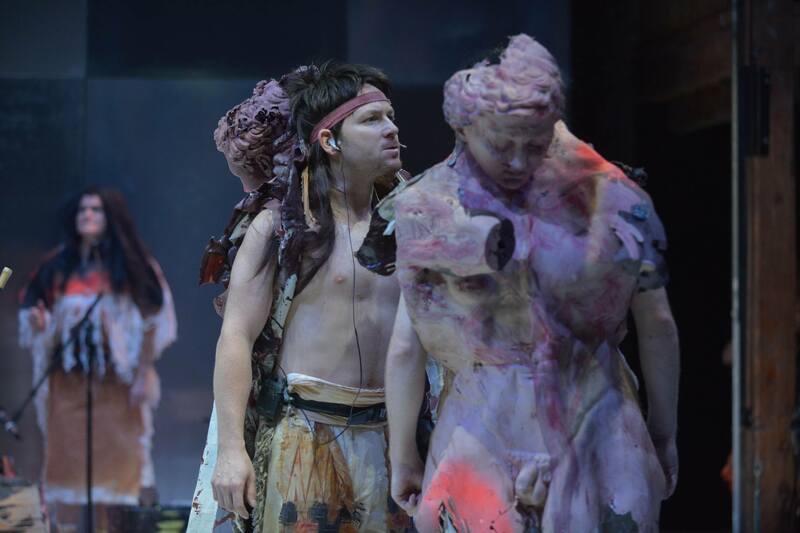 Director Elizabeth LeCompte and the Wooster Group have converted the collaboration into an independent piece, reimagining the Trojans as a pastiche fictional tribe of early Americans struggling to assert its dignity in the face of doom. The Facebook event generated a lot of comments from Natives and others:The commodification that your show makes from ‪#‎redface‬ is immoral and an ethical violation towards ALL indigenous peoples who occupied this land from time immemorial. Cancel the show! Do you actually have a show using redface makeup in 2014 or did I just have a bad dream? Please respond to community criticism. Can you not cast Native or minority actors? Who thought this was a good idea? Trying to be "edgy"? Can we contact the NEA about this? Your description states -->"....fictional tribe of early Americans struggling to assert its dignity in the face of doom"<-- Guess what folks, there are REAL native tribes in this country RIGHT_NOW struggling to assert our dignity in the face of as*hats that seem to think it is okay to parade around in REDFACE and continue the harm of stereotyping of native Americans for others entertainment. Shame on you people, shame.... I deeply admire TWG's work. But no longer. I walked out of tonight's show because I felt like I was attending the avant-garde theater's equivalent of a red face frat theme party. While I've studied and written about the long traditions of racism in the experimental as well as mainstream arts, I was ill-prepared for this barefaced reversion to red face as an attempt to revise Shakespeare's revision of Greek tragedy. Yes, I "got" the attempts at postmodern, postracial irony and farce, e.g. the repetition of the line "John Wayne's teeth" from Chris Eyre's movie Smoke Signals, the use of what looked like anthropological footage of Natives, etc. But in the end TWG's message is that white people think they can do anything. Especially to Native peoples. This kind of racism should be unthinkable. What does it take to see Native peoples as human beings? Cancel the show. Please cancel this show. This is a mockery of the lives and struggles of actual Native people and it is frankly disgusting. So I would like an explanation to how you believe this display of red face would ever be acceptable? If you are really all that ignorant that is pitiful. I hope you didn't do this to bait for attention. If negative press is what you intended then prepare to get plenty of it. It's in everyone's best interest to cancel this atrocity. Really? Redface? That's not "edgy" and "innovative," it's tired old tripe. Oh, and racist; let's not forget about that. Stop this, and donate any money you may have already made to Native peoples who continue to experience the crushing effects of the genocide this play reproduces along with ongoing commodification of their cultures for the benefit of other people. The National Endowment for the Arts sponsorship only spreads the blame for this vile racism. Cancel this show immediately. It is not ok for settlers to mock indigenous targets of settler colonial genocide. Why use a "pastiche fictional tribe" of natives (<-- what you mean when you use the colonizer's term "Americans")? Natives today, throughout Turtle Island, are engaged in struggles to assert dignity in the face of settler genocide. Amongst these populations are playwrights. If the topic interests you then you should have supported indigenous artists rather than dressing settlers up in redface. It's appalling. Now you only create another horror for Natives "to assert their dignity in the face of." One commenter tried to reason with the Wooster Group:I know it can be hard to admit that you've made a mistake in public, especially when that mistake involves perpetuating racist stereotypes about indigenous peoples. And I also realize that it's going to be uncomfortable for you to cancel the event that you've put so much time and energy into. But you need to not just think about your own discomfort, and start thinking about the discomfort that your racist redface act is going to cause for Native peoples. You need to think about the violent oppression that they experience on a daily basis as a result of these types of racist stereotypes leading people to see them as less than human. Yours is the discomfort of admitting a mistake and cancelling a show. Theirs is the discomfort of genocide and racist abuse. Since the play is an adaptation of Shakespeare, I doubt there was much room for a Native writer to come in and rewrite it. Since the play is funded "in part by a generous grant from the National Endowment for the Arts," I doubt the Wooster Group would cancel the play and give back the grant. It's much more likely to ride out the controversy. Since the play is showing only for 11 days, there's no point to a boycott. The run will be over before anyone can organize anything. 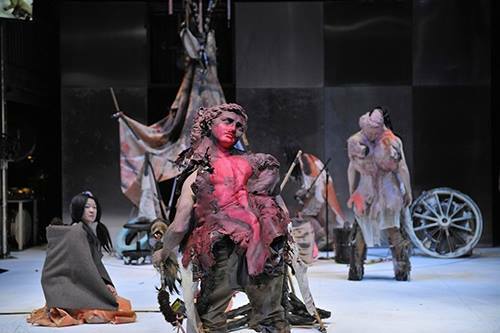 I gather the Wooster Group originated this show with the Royal Shakespeare Company in London. The Wooster Group did the Trojan half of Trolius and Cressida. It then brought this subset of the play to New York and Los Angeles on its own. I also gather that people have contacted the Wooster Group and complained about the show at each stage--to no avail. The Wooster Group is ignoring the controversy, or perhaps stoking it to increase ticket sales. The short run works against activists who would protest the play. But I wouldn't waste too much time trying to reason with the Wooster Group. If the play appears again, I'd set up protests outside the theater, start a social media campaign, and contact the group's nonprofit and corporate sponsors. 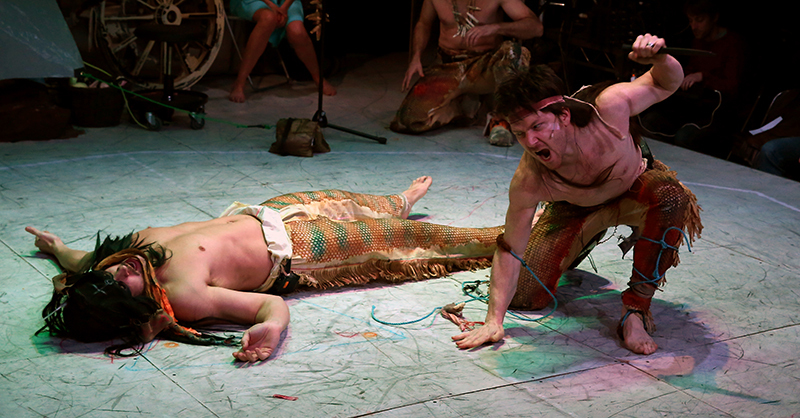 A "pastiche fictional tribe" means a clichéd Plains tribe of teepees and half-naked warriors. This serves to homogenize the Americas' hundreds of cultures into one, to erase their wide-ranging diversity. That's stereotypical. Using a "tribe of early Americans struggling to assert its dignity in the face of doom" places Native people in the past and assumes they were fated to die and disappear. That's stereotypical. Needless to say, most tribes survived and are thriving today. 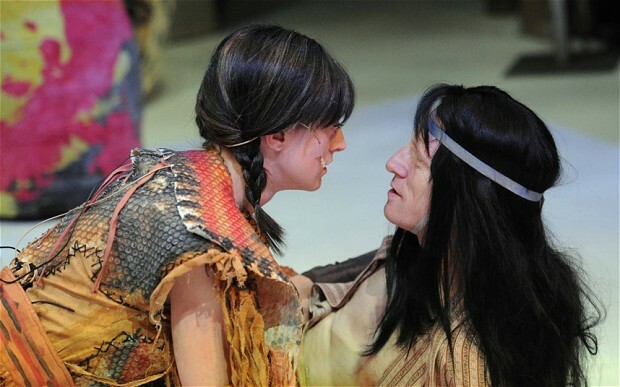 This play reinforces a commonly held but false impression of Native history. Using white actors dressed in redface implies that being Indian is all about how you look and dress. Like any Halloween costumes, it makes a mockery of real tribal customs and practices. That's stereotypical. These "Indians" look so phony that they're laughable. 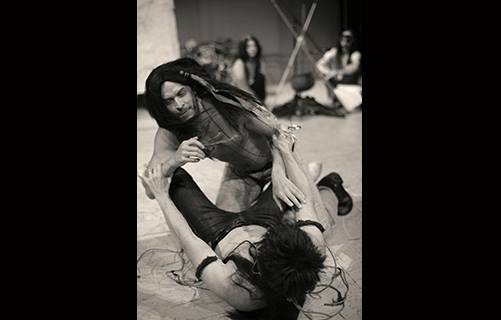 Anyone who knows Native cultures would think this was a burlesque show out of the vaudeville era, not a serious play. Below: Looks like "Indians" fighting and dying tragicially.